Raspberries are made to pair with chocolate – the ultimate pleasure! 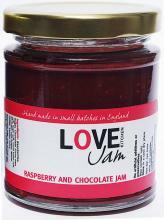 Here we used 25g of 56% cocoa chocolate for ever 100g of raspberries. This is a seriously chocolatey experience. For real decadence, use it on crispy buttered, brown toast, or melt a little to enhance many deserts.